Slideshow Galleries are galleries that automatically flick through your images. The images will be displayed one by one, changing frequently, according to the Autoplay Settings you select. 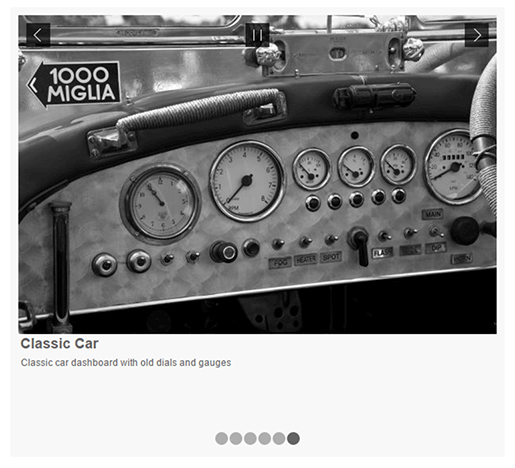 Step 1: From the Main Menu, select Create a New Gallery from under the Images & Media header. Step 2: Enter your Navigation Text and Page Title. The Navigation Text will be displayed on your site navigation and is also shown in the web address for this page. The Page Title is the text that will appear in the top bar of your browser. Click the Next button. 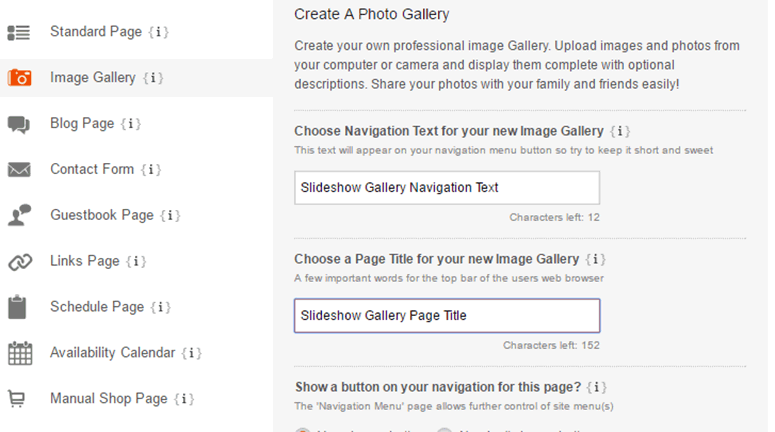 Step 3: You will be taken to the Uploading Images to: Gallery page. Here you can Drag & Drop image files, Browse Computer for Files or select Use Previously Uploaded Images. If you choose to Browse Computer for Files, simply select all of the images you want to appear on your Gallery from your computer and click Open. Once all of your images have been uploaded, click Next Step. 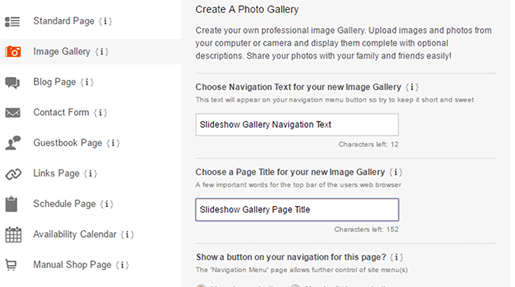 If you choose to Use Previously Uploaded Images - you'll be taken to your Media Library; where you can use the Add Image check box to select the images for your Gallery. Once you are happy with your selection, click the Add Selected Images button at the bottom of the page. Step 4: Now you should see all of your images with fields next to them, this is where you can organize your photos by section, change the order and add an Optional Page Introduction. Step 5: Using the field to the right of the image, add an Image Title Tag and Image Caption - this will display under your image. Once you are happy with the Title & Caption, press the Save Changes link above the image caption box. 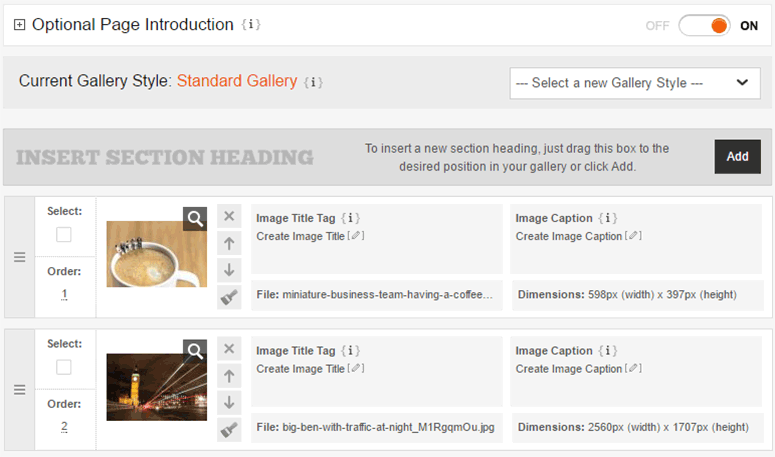 Step 6: You can also include Section Headings in your gallery, splitting your images into categories. You can add a section heading, by clicking it and dragging it down to where you want it in the order of your images. You can also add a Title Heading & Title Text here. 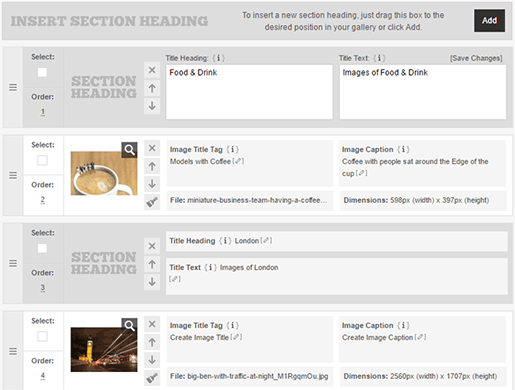 You can re-arrange the order of your images and sections by using the Up & Down Arrows. 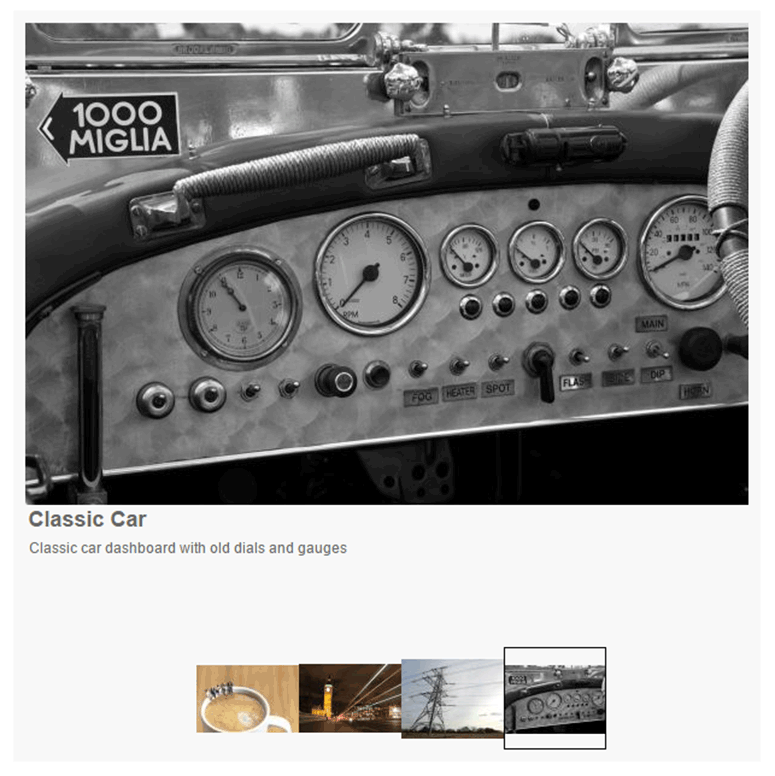 To choose a your layout, click the Gallery Style Drop-Down Menu. 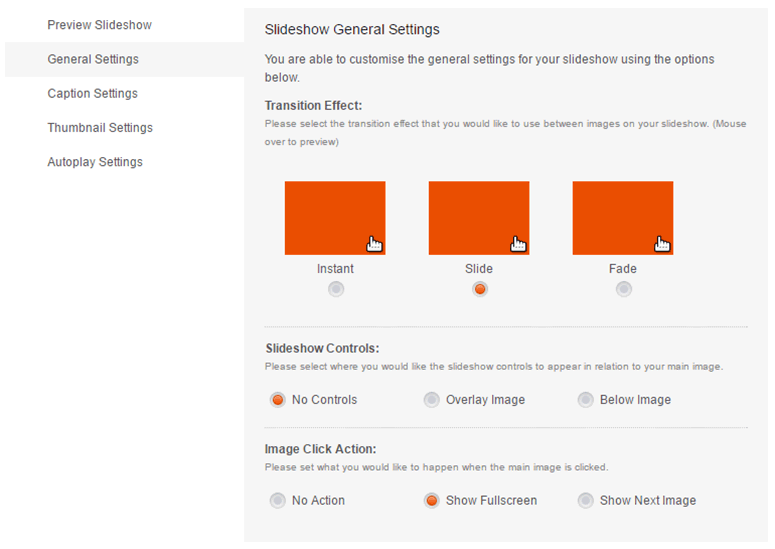 There are 3 options for using a Slideshow Gallery - Image Slider, Tiled Thumbnails & Thumbnail Slider. You can choose a Static Gallery layout; take a look at our Static Gallery Tutorial to find out more. This is the default slideshow layout. 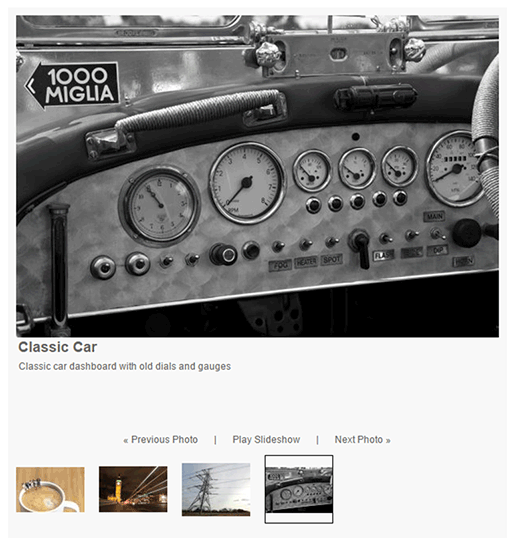 There are no further layout options with this gallery type. An example of the Image Slider Layout can be seen below. 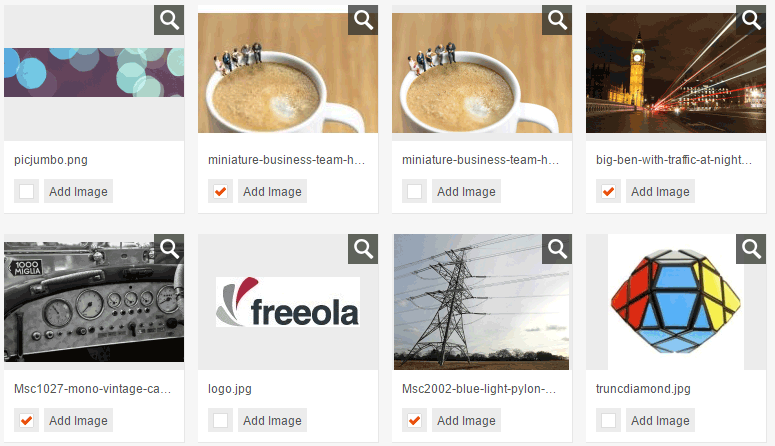 This displays tiled thumbnails of all the images in the gallery next to your slideshow. You can select whether your thumbnails will be displayed to the left, right or below your slideshow. An example of the Tiled Thumbnails Layout, with thumbnails set to display below can be seen below. This displays a slider with all of the thumbnails of your images below your slideshow. There are no further layout options in this gallery type. An example of the Thumbnail Slider Layout can be seen below. When you choose a layout, below the layout preview you should see the options buttons. These allow you to tweak various settings for your slideshow. General Settings: covers transition effects, displaying slideshow controls & image click actions. Caption Settings: covers displaying captions, caption positioning & caption height. Thumbnail Settings: covers thumbnail type & thumbnail icon style. Autoplay Settings: covers turning autoplay on or off, autoplay timing & displaying a timing bar. Now you have uploaded, named & organised your images and chosen your layout, click Finish.